When boarding cats in your cattery it is vital that you learn how to recognise the signs of illness in cats. 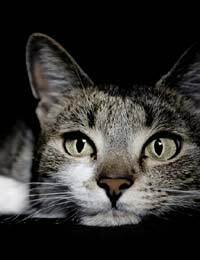 Recognising the symptoms of illness in cats becomes easier with experience, but if you are in doubt as to whether a cat is unwell or just sulking/frightened you should not take any chances, much better to take the cat to the vet even if it proves to be a false alarm. When a cat first comes to your cattery it will naturally feel nervous and apprehensive about what is happening to it. The majority of cats will settle down straight away but there will always be the ones who take a while before they relax and start eating properly. Normally if a cat doesn't eat for a couple of days they do not seem to come to any harm, and if you can coax them with a little tuna or chicken they will come round. The time to be concerned is if a cat who normally eats well suddenly goes off it's food. You could have an ill cat to deal with. You have to ask yourself several questions before going to the vet. Have you changed the food you are offering? Even a different flavour can make the difference. Have you changed the brand of food? Some cats will only eat a particular brand. If you try coaxing with something tasty that the cat would normally eat and it still turns it's head away it could be unwell. When you clean the litter tray the faeces will give you a general indication of the cats health. If the cat has diarrhoea you should firstly consider if this is because of a change of diet. If altering the diet slightly improves matters you will know the cause. If the cat has diarrhoea and sickness it would be a sign of an ill cat and a visit to the vets is indicated. Many cats eat too quickly and regurgitate their meal almost immediately. This is not a sign of illness but if you try giving a very small amount of food to start with and after the cat has kept that down for half an hour or so you can feed the rest. Other symptoms of illness in cats can be more subtle. If they lay around with their paws tucked underneath their chest with their head low, they are probably feeling unwell. If you pick them up and they feel limp in your arms they are probably feeling unwell. The old adage of a cold wet nose is a test that you can try, but not all cats have cold noses. A combination of any of the above should be enough for you to consider a visit to the vet. It is much better to be safe when you are dealing with other peoples pets. When you take an elderly cat for boarding you should always ascertain from the owners what you should look out for. Many old cats have reduced appetites and if you are aware of this you will not panic. Many old cats will be on medication and you should be sure that you can administer it before you accept them for boarding. Some old cats rely on their medication to stay well and it will be a lot easier to administer if you can crush the tablet into food. If you need to put the tablet/capsules etc. into the cats throat make sure you can do this comfortably, otherwise the cat will become stressed and so will you. Most old cats sleep most of the time, but you will want to see that the cat is eating, and using the litter tray regularly to be sure that it is not unwell. As with a young animal old cats can get stressed when taken out of their usual surroundings and you should allow for this, but if in doubt call the vet.